An online demonstration is available to test the look and feel of the onSite web user interface. It includes many of the features available in the download version. Four main sections are displayed: a configuration selection; a sitemap view; a file tree view; and the configuration settings. Configuration settings are displayed in the drop-down select box. Select the appropriate configuration and press the 'Go' button. The data will load in the three display sections below. To create a new configuration, select 'New' from drop-down menu and assign a name for the new file. The new configuration settings can then be edited in the configuration view. 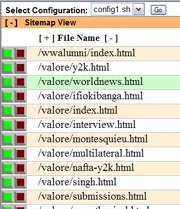 The Sitemap can be sorted by URL name and by the last modified date, using the [+] and [-] symbols in the heading. Each URL can also be launched in a preview pane. Broken links and URLs to be excluded from the sitemap are highlighted in red. The URL priority and change frequency attributes are set through the drop-down select boxes. The server file tree displays all files matching the selected file type extensions. Directories can be expanded and contracted using the [+] and [-] symbols. Individual files and entire directories can be included (or excluded) in the sitemap by pressing the green and red buttons to the left of each file name. These selections are automatically reflected in the sitemap view, which can then be edited for the appropriate priority and change frequency attributes. The selected configuration can be edited in order to specify the server locations, the selected file type extensions, default sitemap values, and the data files where the listings are stored. The sitemap is saved in three different data formats: a sitemap.xml format, a urllist file, and a standard file list. The names for these data files are specified in the configuration settings.